Alpha Bottle is the flagship product by Alpha Designs, a company specialised in the production of shakers with unique functionality. Apart from its volume of 750 ml that makes it possible to prepare any type of powder, including gainers that require a lot of powder and water, the bottle stands out thanks to a number of innovative solutions that make preparing your favourite powders even simpler. If a company is specialised in an area as narrow as shakers, producing only one model (in different volume versions) at an international level, you can be sure that the simple bottle combines features uncommon in other products of that type. That is the case with the flagship product of Alpha Designs. The product looks modern but also minimalist. A transparent bottle has a black lid and a silver logo of the manufacturer that will not fade even after multiple washing in high temperature in a dishwasher. The design is simple but firm, it represents the entire idea of the manufacturers – minimum frills, maximum comfort of use. The focus on functionality is visible at first glance in the shaker’s shape. Apart from being made remarkably aesthetically out of highest-quality materials (DEHP- and BPA-free), its shape is adjusted to the universal size of mug holders, commonly used in car armrests or the back of seats. Thanks to that, you can put the shaker away while travelling without closing it and you can be sure that not a drop of your favourite supplement will spill. Bottle walls also contain special anti-slip grooves that guarantee a strong grip even if your hands are sweaty after intensive training. Taking into account the experiences of sportspeople with popular shakers, the designers of Alpha Design decided to put an end to leaking lids and created the lid of the bottle from scratch. It consists of a small lid that fits tight against the bigger screw-on part of the lid. Under it you can find something that you will look for in vain in other products of that type – a special silicone seal created under the name “Alpha Seal”. It gives 100% certainty of leaking protection. Another common problem among sportspeople who prepare liquid supplements are lumps formed from powder. The manufacturer of the shaker took that into consideration as well and put an end to insufficiently mixed supplements. The bottle contains a unique strainer in the shape of a cone that mercilessly breaks down even the smallest lumps, and the semi-round bottom of the bottle prevents powder particles from sticking to it and makes washing it easier. When using this shaker, you don’t have to worry that very high or low temperatures will deform it. The product can be safely used in the full range of temperatures, from freezing to boiling. That means that the content can be frozen or heated in a microwave. The manufacturer also makes cleaning the shaker easier – you can freely wash it in an automatic dishwasher. The shaker Alpha Designs Alpha Bottle is a combination of attractive appearance with numerous innovations that are hard to find in other shakers. The manufacturer proves that even such a popular product can be elevated to the top of its functionality by perfecting virtually every element, from the lit to the bottom. 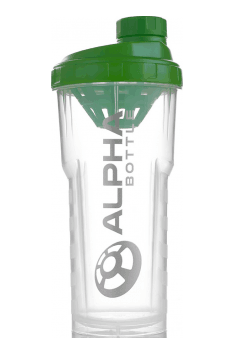 ALPHA DESIGNS is a company focusing on the production of the highest quality shakers for athletes. Such narrow specialization allows the manufacturer to refine the products they offer, which makes them a combination of maximum functionality and original, eye-catching design. Not only does it combine the advantages of the shakers available on the market, but they are also the authors of many original solutions, optimizing the comfort of their use. Each product from ALPHA DESIGNS offer is manufactured for advanced athletes, expecting absolute reliability from used accessories. Therefore, every shaker from this producer is manufactured in such a way as to ensure maximum convenience in preparing nutrients and offer the highest mechanical strength allowing its use in the most difficult conditions. The highest quality raw materials are used for their production, making these products safe and health resistant. Professional training gloves designed for practicing strength. Made of soft, reinforced leather. Towel training. Made of thick cotton of high quality. Fastening for lace shoes with two comfortable clips. They provide the highest comfort.